But like many mid-1950s “bonus babies,” Leja was a victim of the revised “bonus rule” of 1952, which required free agents signed for more than $4,000 to remain on a major league roster for two years.2 Successes like Al Kaline and Sandy Koufax were rare — and Koufax took several years to break through. These stars overshadowed the teenagers and college players who could not meet unrealistic expectations, were improperly developed, or worse. And that’s what Leja did for two seasons until he met his roster requirement. The first baseman got into just 19 games as a Yankee and made merely seven plate appearances, while playing in the field for 12 innings. He was sent to the minors in 1956 and it took six years and over 1,000 games to return to the top level with the Los Angeles Angels. Seven games later, his major-league career was over. Frank John Leja (the family name is Polish) was born on February 7, 1936, and grew up in Holyoke, then a thriving mill city on the Connecticut River in west-central Massachusetts. Leja and his younger sister Louise lived with their father and mother, Frank Sr. and Julia (Wojtasczyk). His father was an auto parts salesman, and his mother was at home. The Lejas were renters in neighborhoods of single- and multi-family homes in Holyoke. Holyoke High School was in the middle of a ten-year period (1944 to 1953) when it advanced to the state baseball finals five times.8 In 1953, Leja’s senior year, Moriarty coached the high school team. That squad included pitcher Roger Marquis, who played one game as an outfielder with the Baltimore Orioles in 1955. Holyoke won the state championship for the second time in four years.9 Leja, who had grown to 6-feet-4 and 205 pounds, led the team at the plate in his senior year. He struggled at the plate as a sophomore and junior, hitting below .225 both years, with a total of nine extra base hits and ten RBIs. His breakout year as a senior, 1953, brought the major league scouting spotlight to Holyoke. With hits in all 21 games, he batted .432, with five home runs, five triples and a double. He had 22 RBIs and 19 stolen bases. His solo home run in a 1-0 sectional playoff win propelled Holyoke to the state championship. In September, tryouts resumed. On the 29th, the day before the World Series began, Frank and his father began final negotiations with the White Sox, Indians, and Yankees in New York. But Leja had already slipped on the depth chart. Originally touted as backup to Joe Collins at first, Leja was displaced by veteran Eddie Robinson, acquired in December. Then another first baseman, Moose Skowron, made the team out of spring training. When Leja got his first paycheck in April, it was based on 1953’s major-league minimum salary of $5,000, not the $6,000 minimum in effect for 1954. Leja raised this discrepancy with AL player representative Allie Reynolds, who bumped it to the front office. The issue then landed before Commissioner Frick. “What the hell is this about your contract?” Frick asked Leja at major-league headquarters. On September 19 Leja was inserted as a pinch runner against the Philadelphia Athletics with none out in the eighth. The Yankees scored four runs and turned over their lineup. With two out in the ninth he singled for his solitary major-league hit. Two years. Nineteen games. Ten as a pinch runner. Five as a defensive replacement. Four as pinch-hitter. Seven at-bats. One hit. Leja displayed his fielding prowess, leading Eastern League first basemen in putouts, assists, and double plays.37 Aspiring ballplayers could buy a Rawlings three-fingered Frank Leja mitt called “The Claw.”38 He started a lifelong friendship with a teammate, shortstop Clete Boyer. The season had its sour moments, said Leja, when the Yankees cut his 1956 salary of $1,500 per month to $500. The front office said the prior poor season plus his annual bonus payment justified the reduction.39 (The bonus was paid in annual installments of $5,000.) After the season Leja married Anne Macarelli, of Nahant, a small oceanfront town in Massachusetts. In 1958 Leja was promoted to Double-A New Orleans. It was small consolation, because five of his Binghamton teammates were promoted two levels to Richmond. Leja played in every Pelicans game, led the team with 29 HRs and 103 RBIs, and was the Southern Association’s top fielder at first base. His OPS of .866 helped him earn an invitation to spring training with the Yankees in 1959. While Skowron was out, catcher Elston Howard and Marv Throneberry played first in New York. At the time of Boyer’s callup, Throneberry was hitting .185 with three home runs. After his career, Leja learned that the Yankees refused to trade him to the White Sox in 1959 despite owner Bill Veeck’s offer of cash to repay Leja’s bonus and salary, as well as three AAA players.45 Instead, the pennant-winning “Go-Go Sox” acquired Ted Kluszewski that August. In 1960, Leja nevertheless said, “I would take the bonus money again.” He noted that it had paid for four years of mental health treatment for his mother.46 He also bought his parents a house and a car, said his son. A serious hamstring injury in spring training dropped Leja to Double-A Amarillo. He told the Yankees he’d recover faster in Richmond, with its better staff and medical equipment.47 Leja reported to Amarillo reluctantly after staying at home for two weeks, but his injury resulted in a .203 average and one home run in 19 games. He threatened to go home again, so he was loaned to Nashville, a Double-A affiliate of the Cincinnati Reds. After another lackluster 54 games, and continued exasperation, he was loaned and demoted again to the Single-A Charleston White Sox. He hit .211 in 36 games. In Richmond, first baseman John Jaciuk played a full season and hit just three homers with 42 RBIs. 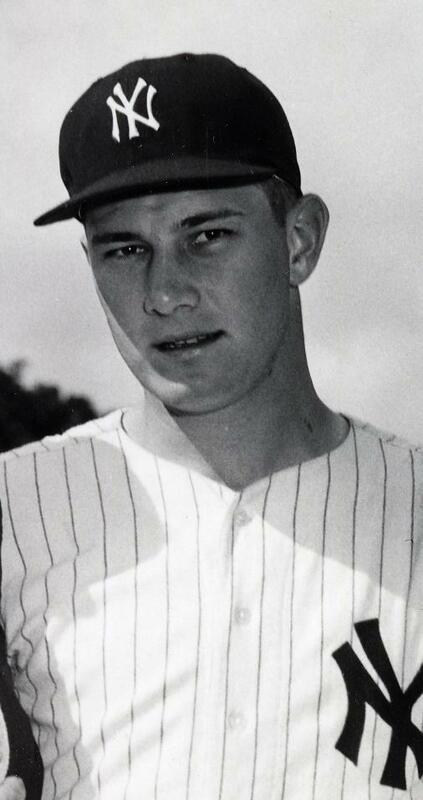 Though Leja’s 1961 contract directed him to report again to Amarillo, he persuaded the Yankees to let him go to spring training with Richmond. He made the team, but sat on the bench. Frustrated again, and ready to quit, he was sold to the Syracuse Chiefs, a Triple-A farm team for the Minnesota Twins. Rejuvenated, Leja hit 30 homers (second in the International League) with 98 RBIs, posting an OPS of .873. Again, he led the league’s first basemen in putouts, double plays, and assists. But when the Twins wanted to add Leja to their major-league roster, they were blocked. The Yankees said they still owned Leja’s rights.48 He called the commissioner’s office, but Frick refused to help.49 The day before the Yankees opened the 1961 World Series, they traded Leja to the St. Louis Cardinals. Ahead of the 1962 season, “it seemed as if I had a thousand pounds lifted off my shoulders,” Leja remembered. “I had never enjoyed spring training as much as I did that year. I was hitting the ball real well and picking up Bill White at first base.” He was told he would platoon with White.50 Although St. Louis had traded away Joe Cunningham not long after acquiring Leja, Stan Musial and Gene Oliver could play the position too. The job competition also included Fred Whitfield and another former bonus boy, Jeoff Long. Thus, 12 days before the start of the season Leja was sold to a second-year expansion club, the Los Angeles Angels. Manager Bill Rigney assured him he would play.51 After 19 games Leja had started four times and was hitless in 16 at-bats. On May 5 he was traded to the Milwaukee Braves. He was sent to Triple-A Louisville and was advised that the Braves would be looking for a replacement for veteran first baseman Joe Adcock after the season.52 Leja hit 20 homers, tied for fourth in the American Association, and was ninth in RBIs despite missing 20 games. His defense at first base earned him the Silver Glove award, given to the top defender at all minor-league levels. In 1963 the Braves sent Leja to their new top affiliate, Toronto. There he played 97 games and hit .240 with 17 homers. In February 1964, just before spring training, Leja was released at age 28. He started making phone calls and sending letters to major-league teams and one in Japan.54 There was no interest. Leja and Anne raised their three sons — Frank Carl, Gary, and Eric — in Nahant. The boys shared their father’s passion for competitive sports. Eric played college hockey at the University of Denver. Frank Carl, the oldest and also left-handed, connected with Eddie Stanky, baseball coach at the University of South Alabama. Stanky, who had been in the Cardinals’ front office when Leja was acquired from the Yankees, offered a scholarship to Frank Carl. After two years at South Alabama, Frank Carl signed with the Red Sox as a free agent. Although he was released at the end of spring training in 1979, left-handed batting practice pitchers were hard to find, so he was hired to throw batting practice to the Red Sox and visiting teams at Fenway Park. Gary played college baseball and football at the University of Mississippi and baseball at the University of South Alabama (although Stanky had retired). He was signed as a free agent by the Cardinals in 1988, was invited to spring training, but was later released. At the 25th reunion of the 1955 Yankees in 1980, as Frank Carl remembered hearing, owner George Steinbrenner assured Leja, “Your career means as much to me as Mickey Mantle’s.” Frank Carl emphasized how much that recognition meant to his father. In 1991, at 55, Leja suffered a fatal heart attack. At the funeral, Clete Boyer sat with Frank’s widow. Leja’s obituaries could not capture his final reflections and how his family tried to come to terms with his bittersweet story. And that’s how he will always be remembered. On Leja’s grave marker in Nahant, where he is buried with his wife, engraved in bronze is the interlocked “NY” representing the New York Yankees. This biography was reviewed by Rory Costello and fact-checked by Kevin Larkin. The author also wishes to thank SABR members Bill Nowlin, Warren Corbett, Dennis Snelling, and Marty Appel for their input and support. Dennis Snelling, A Glimpse of Fame, Jefferson, North Carolina: McFarland & Co. (1993): 229-245. Paul Hemphill, Lost in the Lights, Tuscaloosa, Alabama: University of Alabama Press (2009): 151-157. Brent Kelley, Baseball’s Biggest Blunder, Lanham, Maryland and London, England: The Scarecrow Press (1997): 40-45. Lester Bromberg, “To His Hometown Fans, Kid Leja’s All Man,” New York World Telegram, October 13 and 14, 1953. Lester Bromberg, “Leja Rates 21-Gun Salute in Home Town,” The Sporting News, February 10, 1954. Rick Cerrone, “Out at First,” Yankees Magazine, May 2014: 120-126. Gerry Finn, “Frank Leja Reflects Bitterly on a Baseball Career That Never Was,” The Sunday Republican, Springfield, Massachusetts, August 13, 1978. Harry Grayson, “What Happened to N.Y. Farm System,” Newspaper Enterprise Association, Edwardsville Intelligencer, Edwardsville, Illinois, May 22, 1965. Stan Isaacs, “Leja Asks ‘One Good Shot’ But Nobody Pays Attention,” New York Newsday, March 15, 1960. Frank Leja and Larry Klein, “The Bad Side of Baseball,” Sport, August 1964. Alan Schwarz, “The Story Behind the Ring,” The New York Times, April 20, 2009 (reader comment, November 9, 2009). “Stengel Not Kicking About Leja and Carroll,” Unknown/Baseball Hall of Fame Player File, March 26, 1955. “Another Gehrig Signed Up by World Champs,” The Era (Bradford, Pennsylvania), October 2, 1953. Baseball Hall of Fame Library, player file for Frank Leja. Frank Leja Uniform Players Contract with New York Yankees, October 1, 1953. Frank Carl Leja, July 20 and September 29, 2018, along with other brief telephone conversations, email, and text messages. Eli Grba, telephone interview, September 26, 2018. 1 Harry Hanson was 17 years and six months when he played one game in 1913. Leja was 18 years and two months. Rick Cerrone, “Out At First,” Yankees Magazine, May 2014, 120. 2 Wynn Montgomery, “Georgia Phenoms and The Bonus Rule,” Baseball Research Journal, Summer 2010, Society for American Baseball Research (https://sabr.org/research/georgia-s-1948-phenoms-and-bonus-rule). 3 Frank Carl Leja, personal interview, July 20, 2018. 4 Ibid., follow-up telephone interview. 5 Lester Bromberg, “Leja Rates 21-Gun Salute in Home Town,” The Sporting News, February 10, 1954, 5. 6 Frank Carl Leja, follow-up telephone interview, from a phone conversation with his aunt, Leja’s sister. 11 Lester Bromberg, “To His Hometown Fans, Kid Leja’s All Man,” New York World Telegram, October 13 and 14, 1953. 14 Dennis Snelling, A Glimpse of Fame, Jefferson, North Carolina: McFarland & Co. (1993): 231. 17 Snelling, A Glimpse of Fame, 231. 18 Frank Leja and Larry Klein, “The Bad Side of Baseball,” Sport, August 1964, 40. 19 Snelling, Dennis, A Glimpse of Fame, 232. 20 Bromberg, “Leja ‘Rates 21-Gun’ Salute in Home Town,” 6. 21 “Another Gehrig Signed Up by World Champs,” The Era (Bradford, Pennsylvania), October 2, 1953. 25 Leja, “The Bad Side of Baseball,” 75. 27 Snelling, A Glimpse of Fame, 234. 30 “Stengel Not Kicking About Leja and Carroll,” Unknown/Baseball Hall of Fame Player File, March 26, 1955. 31 Snelling, A Glimpse of Fame, 237. 32 Leja, “The Bad Side of Baseball,” 76. 33 Brent Kelley, Baseball’s Biggest Blunder, Lanham, Maryland and London, England, The Scarecrow Press (1997): 40-45. In 1955 and 1956 Carroll started one game, appearing in 49 others as a pinch hitter, pinch runner, or defensive replacement. 34 Eli Grba, telephone interview, September 26, 2018 (hereafter Grba interview). 35 Leja, “The Bad Side of Baseball,” 76. 36 Alan Schwarz, “The Story Behind the Ring,” The New York Times, April 20, 2009 (reader comment, November 9, 2009). 37 Snelling, A Glimpse of Fame, 242-43. 38 Worthpoint.com, Frank Leja Rawlings Model T107. 39 Leja, “The Bad Side of Baseball,” 76. 42 It was 365 feet down the right field line at Parker Field through 1962, according to the field’s Facebook page. Leja said it was 395 feet to right center (Leja, “The Bad Side of Baseball,” 76). He hit 20 of his 23 home runs on the road (Isaacs, “Leja Asks ‘One Good Shot’ But Nobody Pays Attention”). 44 Snelling, A Glimpse of Fame, 238. 47 Snelling, A Glimpse of Fame, 239. 49 Gerry Finn, “Frank Leja Reflects Bitterly on a Baseball Career That Never Was,” The Sunday Republican (Springfield, Massachusetts), August 13, 1978. 50 Leja, The Bad Side of Baseball, 76. 53 Phil Roof, telephone interview, September 22, 2018. 54 Leja, The Bad Side of Baseball, 38. 57 Harry Grayson, “What Happened to N.Y. Farm System,” Newspaper Enterprise Association, Edwardsville (Illinois) Intelligencer, May 22, 1965. 58 Leja, The Bad Side of Baseball, 77. 60 Letter from Frank Leja to MLBPA, August 27, 1989. 61 Letter to Frank Leja from MLBPA, September 27, 1989. 62 Snelling, A Glimpse of Fame, 237. 65 Cerrone, “Out At First,” 124.